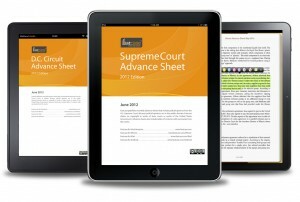 Fastcase Advance Sheets are a series of eBooks available for on iPad, Kindle, Android, and Nook devices. 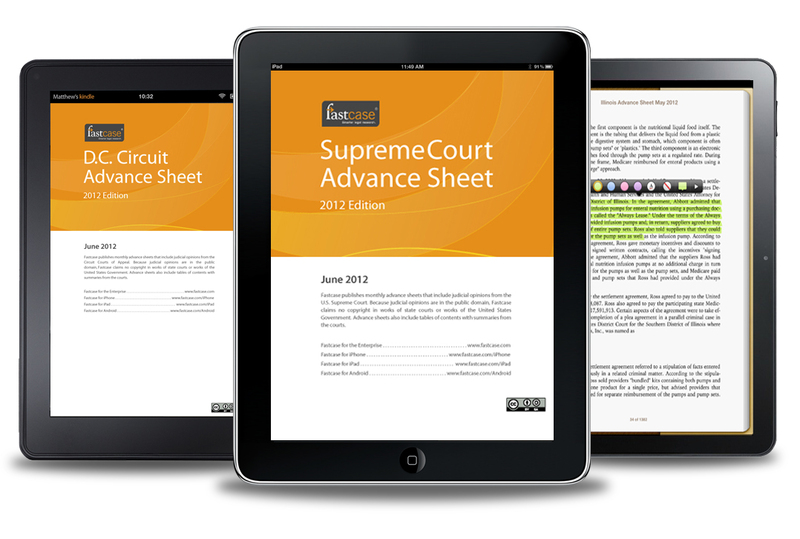 Fastcase Advance Sheets give lawyers a first look at judicial opinions from around the country in eBook format, replacing printed law books. Advance sheets will be issued monthly for state and federal courts, including judicial opinions from courts of appeal and supreme courts. The term “advance sheet” has been used for more than a hundred years to describe the paperback drafts mailed to lawyers and libraries before the printing of paper books. Subscriptions to the advance sheets alone cost upwards of $850 per year, for each of nine or ten series of reporters – the final books cost even more. Lawyers in years past would thumb through advance sheets from their jurisdiction, looking for decisions of interest in their field. But with the proliferation of judicial opinions, nobody can carry around all the paper books, much less scan through them for important rulings. Even though the volume of decisions has dramatically increased, nobody has really re-thought the way we publish caselaw reporters since the late 1800s, when John B. West created the regional reporter system that became West Publishing Company. Nobody until now. The companies that print paper books can’t or won’t re-invent the industry, but Fastcase can and will. Fastcase has replaced the heavy, voluminous, redundant caselaw reporter with modern eBooks that are slim, light, and beautiful. Fastcase’s Advance Sheets are more comprehensive than traditional paper tomes, because they include all decided cases – even “unpublished” opinions that won’t be printed in the books (but which are precedential in many courts, and often contain persuasive authority). And because the Fastcase collection is in eBook format, it will work on most e-readers, including iPad, Kindle, Nook, and Android tablets. That also means that text can be highlighted, copied, shared, annotated, rotated, read on an airplane or train, or even on a beach. And instead of reading an entire paper advance sheet, Fastcase eBooks can be searched for key terms, and they include introductory summaries highlighting the issues in each case. Unlike their paper counterparts, Fastcase Advance Sheets will be free. Because Fastcase already collects these opinions for its desktop legal research service, publishing them in eBook format is simple, and the marginal cost is low. So Fastcase offers them for free, consistent with our mission of democratizing the law and building smarter tools for legal research. Fastcase also will introduce a series of paid eBooks later in the year, with advanced features and highlighting particular subject areas – so lawyers can follow the latest cases in their chosen field. But the Advance Sheets will continue as a free product, under a Creative Commons license. Fastcase’s work on eBooks has drawn inspiration from paper advance sheets from West Publishing, as well as the pioneering work of Elmer Masters of CALI, who produced the first eBook reporters with the Free Law Reporter in 2011, using the RECOP data feed. – Free, and licensed under Creative Commons BY-SA license.